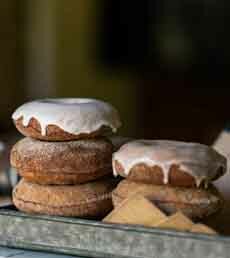  The best-known use of boiled cider is apple cider donuts. Here’s the recipe. (all photos courtesy King Arthur Flour). 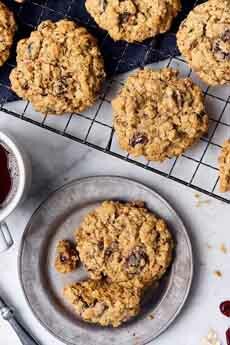 Used boiled cider to make these cranberry-raisin oatmeal cookies taste even better. Here’s the recipe. 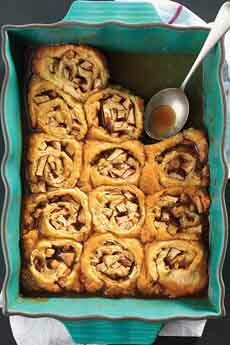 These apple dumpling slices are a cross between dumplings and sticky buns, pie and cobbler. Here’s the recipe. 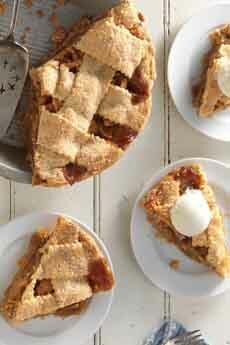 See how your apple pie can taste even better with boiled cider. Here’s the recipe. It’s time to order a pint of boiled cider. If you’ve ever had cider donuts, you’ve had boiled cider. Boiled cider (photo #5) is a syrupy, dark-amber liquid that’s as thick as molasses. It’s made by boiling down apple cider. This cook’s-and-baker’s ingredient adds just-picked apple flavor to your favorite recipes: not just donuts but cakes, muffins, pies, scones and quick breads. Its natural acidity combined with baking soda provides extra lift in baked goods. It’s also a cook’s trick for amplifying the apple flavor in apple pies, apple cakes and applesauce. And, it’s great even if you don’t cook and bake: to make “instant” apple cider, yogurt and ice cream toppings and more (see the many uses below). “Boiled cider is one of those ingredients I didn’t know I needed until I tried it. I first used it in an apple pie and was amazed by the way it sharpened the apple flavor in my filling. “I quickly became hooked! Now I use it in everything from cake batters and quick breads to salad dressings and pancake syrup. King Arthur Flour’s boiled cider is a top-of-the-line product, made from the best apples, using artisan techniques. It’s made by Willis and Tina Wood of Wood’s Cider Mill in Springfield, Vermont. Family-made since 1882, the cider is pressed from local apples in an antique screw press that dates back to the original cider mill. 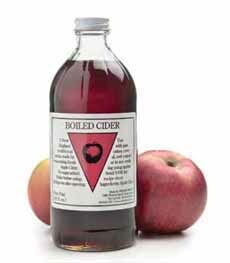 One gallon of cider is then reduced down to one pint of boiled cider in a wood-fired stainless steel evaporator. The result: pure, concentrated cide with absolutely nothing added, ready for action. If you find yourself with a surfeit of apple cider, you can boil it down yourself. Here’s a recipe from The Baker Chick. But for a guaranteed excellent experience, get a bottle from King Arthur Flour. Use the sweet apple concentrate as a substitute for other sweeteners: honey, sugar or maple syrup. The flavor is intense, so add a bit at a time and taste to check the sweetness level. A flavoring for hot or cold milk. Instant hot or cold cider (1 tablespoon per 3/4 cup water, optional rum or bourbon for the adults). Sparkling apple cider: add 1-2 tablespoons to a glass of seltzer. A sweetener for oatmeal and other porridges. A glaze for chicken, pork and salmon (try mixing with whole grain mustard). An accent to baked squash. All of the baked goods above. Anything pumpkin or with pumpkin pie spices. These recipes are from King Arthur Flour, an excellent source of recipes that have been tested to perfection.